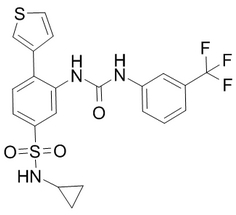 GSK321 is a potent and selective IDH1 mutant inhibitor. 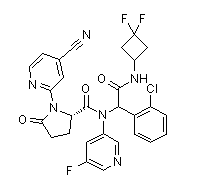 BAY-1436032 is a novel pan-mutant isocitrate dehydrogenase 1 (IDH1) inhibitor. 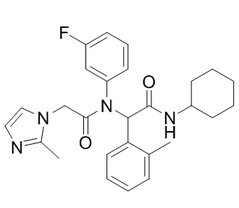 Mutant IDH1-IN-1 is a potent mutant IDH1 R132H inhibitor with IC50 < 0.1 uM(A level in Patent); more bioactivity information in Patent WO2012009678A1. Mutant IDH1 Inhibitor is a potent mutant IDH1 R132H inhibitor with IC50 of < 72 nM. Mutant IDH1-IN-2 is a inhibitor of mutant Isocitrate dehydrogenase (IDH) proteins, with IC50 of in LS-MS biochemical assay, IC50 of 16.6 nM in Fluorescence biochemical assay. AGI-6780 is the first highly potent and selective small molecule inhibitor of isocitrate dehydrogenases, which binds in an allosteric manner at the dimer interface of mutant IDH2-R140Q. 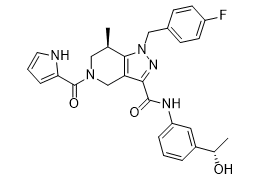 AGI-5198, a novel R132H-IDH1 inhibitor, identified through a high-throughput screen blocked, in a dose-dependent manner, the ability of the mutant enzyme (mIDH1) to produce R-2-hydroxyglutarate (R-2HG). 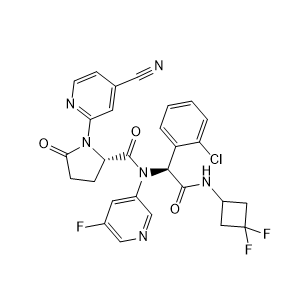 Ivosidenib is an orally available inhibitor of isocitrate dehydrogenase type 1 (IDH1), with potential antineoplastic activity. Ivosidenib specifically inhibits a mutated form of IDH1 in the cytoplasm, which inhibits the formation of the oncometabolite, 2-hydroxyglutarate (2HG). This may lead to both an induction of cellular differentiation and an inhibition of cellular proliferation in IDH1-expressing tumor cells. 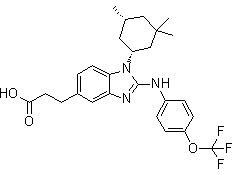 Ivosidenib, also known as AG-120 and RG-120, is an orally available inhibitor of isocitrate dehydrogenase type 1 (IDH1), with potential antineoplastic activity.